stirring and shaking of single or multiple reactions. These remarkable systems replace messy oil baths and breakable glass dewar offering a better efficiency while eliminating all their disadvantages. The findenserTM replaces the need for water-cooled condensers in over 95% of all common chemistry applications. You will like them in many applications thanks to their high modularity. Heat-On Block system & Cool-it Insulated Bowls cover a temperature range from -78 °C up to 200 °C. Optimal magnetic stirring is ensured by a stirring hotplate. 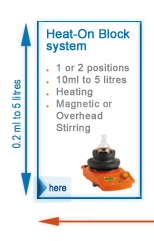 Standard round bottom flasks from 10ml to 5L can be used with them. Ideal for your classical synthesis they will make your chemistry safer, cleaner and faster.